As discussions grow in size and depth about the future of alternative fuel sources and alternative energy, one voice is growing louder — Purdue’s School of Chemical Engineering. As a ChE graduate student studying energy issues, Sarah Yohe brings a unique perspective to the conversation. In her spare time, Sara Yohe enjoys being part of the chemical engineering student community. She also plays basketball and piano, and loves swimming and gardening. Hailing from a farming background in the Dakotas and Minnesota, Yohe, whose research is in the field of renewable energy and catalysis, is interested in the conversion of biomass into transportation fuel. The idea of using her passion for science and engineering for the betterment of society came about during an internship in North Dakota Sen. Byron Dorgan’s office in Washington, D.C., during the summer of 2005. “During the internship, I was afforded opportunities to learn about the political side of technological issues, attend conferences on technological topics and work on energy related legislation,” Yohe says. Yohe set about making this happen by enrolling in a dual degree program between Concordia College in Moorhead, Minn., and the University of Minnesota in Minneapolis. She graduated in 2008 with a bachelor’s in chemical engineering and a BS in chemistry from Minnesota and a BA in applied science with a mathematics minor from Concordia. Yohe’s catalysis and energy research has garnered some attention. She is the recipient of a 2010 National Science Foundation Graduate Research Fellowship. On campus, Yohe is a founding member and vice president of the Chemical Engineering Sustainability initiative (CSi), a student organization dedicated to stimulating a sustainable lifestyle within the School of Chemical Engineering. 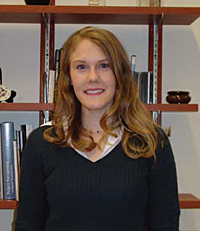 She also was elected in May as the 2010-11 Purdue Chemical Engineering Graduate Student Organization (GSO) president. After completing her PhD at Purdue, Yohe plans to continue with catalysis and energy research and teach at the university level. “This will allow me to continue working in an area I am passionate about and give me the opportunity to share this interest with students,” she says.